These convenient 100% cotton double layer burp cloths are great sweater savers for mom and dad – and look good while you’re being “spilled” on. Sold in triple packs, these spill cloths fit nicely on one’s shoulder or lap and are compact for easy diaper bag storage. Measures approximately 8”x19”. 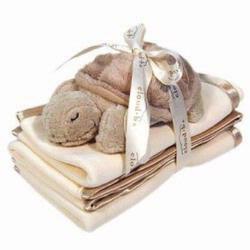 The Satin Trim Set includes three spill cloths in natural with an adorable Sleep Sheep & Friends plush rattle of your choice (Baby Sheep, Baby Turtle or Baby Lab).